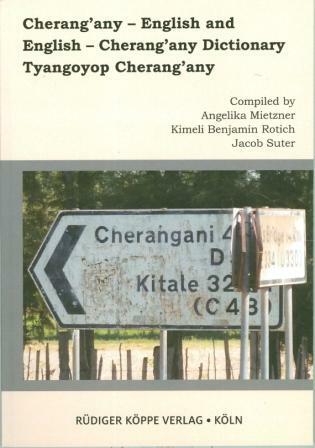 Cherang’any is a language that is spoken in the Western part of Kenya, close to the Ugandan border. At the beginning of colonialism, the Cherang’any speakers used to live in scattered groups in a vast area in Trans Nzoia and part of Uasin Gishu. Starting from 1911, the land was divided and given to British settlers. By the time of independence, the land was not handed back to the Cherang’any, but was sold by the Kenyan government to Kenyans who are called black colonizers. Cherang’any is classified as Marakwet. The term Marakwet is a corruption of the term Markweta and was not existing prior to the colonial period (Moore 1987:88). Several communities fall under the Marakwet cluster (Cherang’any, Endo, Almoo, Kiptani and Markweta). During the colonial regime, a Marakwet district was created in order to control the land and people more easily. In order to fit into the colonial administrative system and to benefit from the allowances, the people also started to call themselves Marakwet, and they still do. Marakwet belongs to the Kalenjin group. The Kalenjin did not exist as a united independent community before the mid-twentieth century, when a movement was initiated to create unity. It was started by a small group of people who had the wish for a larger ethnic group in order to gain access to land properties, control of space and state resources (Lynch 2011: 7). The term Kalenjin, which means “I tell you”, was used 1940 by the radio presenter John J. K. arap Chemallah as the opening words of his radio show, where it soon became iconic for the linguistic identity of those who could easily understand the broadcasted programme. The dictionary is designed for the Cherang’any people of Kenya. For this reason, the Cherang’any orthography is used, which does not display vowel quality and tone. The dictionary contains only part of the Cherang’any vocabulary and was not designed on the basis of a wordlist, but rather based on texts. Additional entries were made by the two co-editors of the dictionary.